If there's a silver lining to the current Ebola epidemic sweeping through Liberia and Sierra Leone, it's that it's happening in 2014 and not in 2000, when the two countries were embroiled in devastating civil wars, complete with civilian deaths and the use of child soldiers. But since March, when the Ebola virus first traveled from Guinea to northwestern Liberia and especially since June, when the first Ebola cases arrived in the capital city of Monrovia, Liberia has increasingly been stuck in the kind of siege mentality that residents thought they'd left behind with the end of the civil war in 2002. Many of Liberia's nearly 4.1 million residents have been subject to a nighttime curfew from 9 p.m. to 8 a.m. Liberian children are no longer attending school, business and hospitals are not functioning at capacity, and mass transit is reduced to a trickle. In short, Liberia's Ebola crisis has become as much a governance crisis as a health crisis. Out of over 8,000 reported cases of Ebola infection (as of October 5), just over 3,900 come from Liberia, which has also reported 2,210 of 3,866 total reported deaths from Ebola. Those numbers don't include many unreported cases of Ebola infection, and the U.S. Centers for Disease Control estimates that the number of reported cases in both Liberia and Sierra Leone could reach 550,000 by January (or up to 1.4 million, including underreported cases). Liberia will be the chief battleground for a U.S. military force of up to 4,000 troops, who will attempt to ameliorate some of the bottlenecks in getting food and medical supplies to health care workers throughout the country. The socioeconomic costs of the Ebola epidemic are, unsurprisingly, rising sharply. The World Bank yesterday suggested that the impact to Liberia's economy in 2014 could amount to $66 million (3.4% of GDP) and between $113 million and $234 million (5.8% to 12%) in 2015. Liberia imports much of its food, and prices for food are rising higher as fewer shipments are delivered to ports as Ebola infections increase. With a GDP per capita of between $450 and $475, Liberians hardly have a margin for much higher prices. In a letter to the Plenary of the House of Representatives and the Senate, Sirleaf asked for powers to amend seven different articles under the constitution, including freedom of movement, speech, religion, confiscation of private property, and elections. Acarous Gray, a member of the House of Representatives from the opposition Congress for Democratic Change, said he intends to vote "no" to the president's request because he doesn't want to return Liberia to the days of military dictatorship. "In my view, this is dangerous, and it reminds us of the days when the dictators govern Liberia. While it is true that we have a state of emergency, the Liberian Constitution under Article 87 is very clear that during the state of emergency no provision of the constitution can be suspended. So, we cannot provide an absolute authority of such to the President that will be draconian. I will publicly advocate against it, and I will vote against it," Gray said. Even Liberia's legislature was forced to evacuate earlier this week, when the sudden death of a doorman in the House of Representatives caused alarm and an emergency chlorine spray-down. Sirleaf, who was narrowly elected in 2005 over football star George Weah, and reelected in 2011 with over 90% of the vote, has long been a favorite of US and European policymakers. That enthusiasm may be misplaced. In her eight years in power, though Sirleaf may have stabilized Liberia in the aftermath of its horrific civil wars, she hasn't dented the corruption that plagues the country's government. Overall, her record is not as sparkling as many world leaders would like to believe. On human rights issues like LGBT persecution and female genital mutilation, Sirleaf has been silent or even antagonistic to reform efforts. She established a Truth and Reconciliation Commission in 2006, but in 2009, Sirleaf was forced to admit that she once backed strongman Charles Taylor in 1989, whose anti-government revolt led to staggering atrocities in the following decade. The commission in 2009 recommended that several Liberians be barred from holding public office, including Sirleaf. 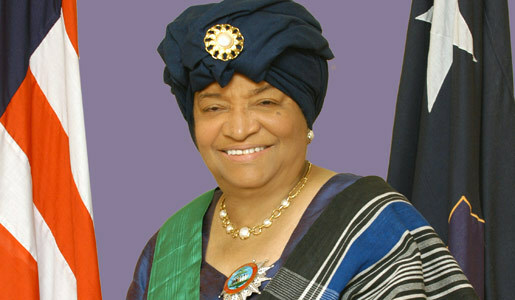 Though Sirleaf convinced creditors to forgive around $1.2 billion of Liberia's public debt, and she won the Nobel Peace Prize in October 2011, her opponents accused her government of electoral fraud in the presidential election that same month, and her rival boycotted the November runoff. Earlier this week, citing frustrations with the slow progress of Sirleaf's administration on corruption and legal impartiality and the lack of Liberia's rule of law, long-serving justice minister Christiana Tah resigned, notwithstanding the ongoing Ebola crisis. She also accused Sirleaf of blocking her department's independent investigations. According to local reports, other ministers may soon follow, an incredibly troubling sign as Sirleaf pushes for constitutional changes in the face of the most difficult policy challenge for Liberia in over a decade. Even as U.S. soldiers bolster Liberian efforts to turn the tide in the country's fight against Ebola, the extraordinary constitutional measures that Sirleaf now seeks could alter Liberian governance for years, long after the Ebola threat is gone. Kevin A. Lees is an attorney in Washington, D.C., and the editor and author of the foreign policy website Suffragio.org.